Ridley: IPCC & OECD reports are telling us clear as a bell that we cannot ruin the climate with CO2 unless we have a population explosion | Watts Up With That? In the past 50 years, world per capita income roughly trebled in real terms, corrected for inflation. If it continues at this rate (and globally the great recession of recent years was a mere blip) then it will be nine times as high in 2100 as it was in 2000, at which point the average person in the world will be earning three times as much as the average Briton earns today. I make this point partly to cheer you up on Easter Monday about the prospects for your great-grandchildren, partly to start thinking about what that world will be like if it were to happen, and partly to challenge those who say with confidence that the future will be calamitous because of climate change or environmental degradation. The curious thing is that they only predict disaster by assuming great enrichment. But perversely, the more enrichment they predict, the greater the chance (they also predict) that we will solve our environmental problems. Past performance is no guide to future performance, of course, and a well aimed asteroid could derail any projection. But I am not the one doing the extrapolating. In 2012, the Intergovernmental Panel on Climate Change (IPCC) asked the Organisation for Economic Cooperation and Development (OECD) to generate five projections for the economy of the world, and of individual countries, in 2050 and 2100. They make fascinating reading. The average per capita income of the world in 2100 is projected to be between three and 20 times what it is today in real terms. The OECD’s “medium” scenario, known as SSP2, also known as “middle of the road” or “muddling through”, sounds pretty dull. It is a world in which, in the OECD’s words, “trends typical of recent decades continue” with “slowly decreasing fossil fuel dependency”, uneven development of poor countries, delayed achievement of Millennium Development Goals, disappointing investment in education and “only intermediate success in addressing air pollution or improving energy access for the poor”. And yet this is a world in which by 2100 the global average income per head has increased 13-fold to $100,000 (in 2005 dollars) compared with $7,800 today. Britain will be very slightly below that average by then, yet has still trebled its income per head. According to this middling scenario, the average citizen of the Democratic Republic of Congo, who today earns $300 a year, will then earn $42,000, or roughly what an American earns today. The average Indonesian, Brazilian or Chinese will be at least twice as rich as today’s American. Remember this is in today’s money, corrected for inflation, but people will be spending it on tomorrow’s technologies, most of which will be cleverer, cleaner and kinder to the environment than today’s — and all for the same price. Despite its very modest assumptions, it is an almost unimaginable world: picture Beverly Hills suburbs in Kinshasa where pilotless planes taxi to a halt by gravel drives (or something equally futuristic). Moreover, the OECD reckons that inequality will have declined, because people in poor countries will have been getting rich faster than people in rich countries, as is happening now. 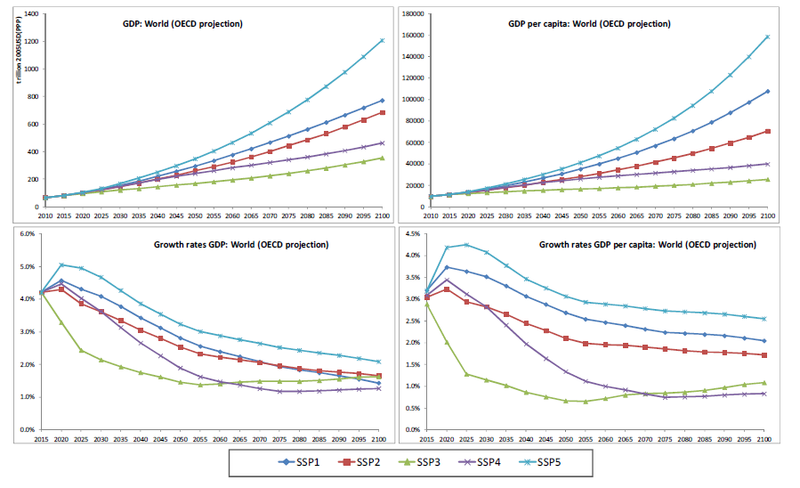 All five storylines produce a convergence, though at different rates, between the incomes of poor and rich countries. Can the planet survive this sort of utopian plutocracy? Actually, here it gets still more interesting. The IPCC has done its own projections to see what sort of greenhouse gas emissions these sorts of world would produce, and vice versa. The one that produces the lowest emissions is the one with the highest income per head in 2100 — a 16-fold increase in income but lower emissions than today: climate change averted. The one that produces the highest emissions is the one with the lowest GDP — a mere trebling of income per head. Economic growth and ecological improvement go together. And it is not mainly because environmental protection produces higher growth, but vice versa. More trade, more innovation and more wealth make possible greater investment in low-carbon energy and smarter adaptation to climate change. Next time you hear some green, doom-mongering Jeremiah insisting that the only way to avoid Armageddon is to go back to eating home-grown organic lentils cooked over wood fires, ask him why it is that the IPCC assumes the very opposite. In the IPCC’s nightmare high-emissions scenario, with almost no cuts to emissions by 2100, they reckon there might be north of 4 degrees of warming. However, even this depends on models that assume much higher “climate sensitivity” to carbon dioxide than the consensus of science now thinks is reasonable, or indeed than their own expert assessment assumes for the period to 2035. And in this storyline, by 2100 the world population has reached 12 billion, almost double what it was in 2000. This is unlikely, according to the United Nations: 10.9 billion is reckoned more probable. With sluggish economic growth, the average income per head has (only) trebled. The world economy is using a lot of energy, improvements in energy efficiency having stalled, and about half of it is supplied by coal, whose use has increased tenfold, because progress in other technologies such as shale gas, solar and nuclear has been disappointing. These IPCC and OECD reports are telling us clear as a bell that we cannot ruin the climate with carbon dioxide unless we get a lot more numerous and richer. And they are also telling us that if we get an awful lot richer, we are likely to have invented the technologies to adapt, and to reduce our emissions, so we are then less likely to ruin the planet. Go figure. April 21, 2014 in Climate News, Climate sensitivity, Economy-health. Mat Ridley is always worth reading, he is one of the most important skeptical scientists up there with Lindzen, Spencer, Christy etc. Solidly argued common sense and sound science. Enjoyed the formula 1 race in Shanghai yesterday. This year’s new engines might sound like tractors, but they bring a big step forward in the technology and efficiency of the internal combustion engine – especially the ingenious design by Mercedes – which will soon find its way to road cars and still further improve fuel efficiency. Improved fuel efficiency in petrol and diesel cars thus continues to undermine the case for electric cars. Economic growth and ecological improvement go together. Thank you! I’ve been saying this since the Nixon era. Titan – Seems reasonable enough. In 1900, avg US income was $438, by 2000 it had increased to $42,000 almost a 100 fold increase. If other countries benefit from technology, educate their population and begin to participate in global commerce then these projections are reasonable. Based on UN figures, in 20 years(1990-2010) half of the folks in really grinding poverty in the poorest 15 countries(~2billion) went from $1.25 a day to $4/day, merely poor. The poverty rate dropped from 43% to 21%. Nobody in the developed world is close to $1.25/day. The US uses $63/day for a family of four, over 10x better than the poorest. China was responsible for most of the drop. The next 20 years will be harder because of the problems with authoritarian/statist/corrupt regimes in Africa, India, and other poorly developed countries. This tremendous improvement was achieved 5 years ahead of plan(2010 vs 2015). So the projections/predictions which Ridley used(also from the UN) don’t look too optimistic to me. But improving development is a surefire way to improve lives, reduce deaths, and reduce pollution. Right now someone at $1.25/day in India simply has no means to use anything but cow dung for fuel, get water from polluted sources, and work like a dog every day just to eat. Hurray for free markets. Most of China’s development is attributed to freer markets. India and Africa are saddled with numerous monopolies, restrictive practices, and tariffs. But other OECD reports related to Green Growth commencing in 2011 and the Great Transition commencing in 2013 state repeatedly that such economic growth will no longer be permitted. It is not environmental degradation that puts us all at risk but all the predatory cronyism going on in the name of Climate Change, Inequality, Race, etc. Whatever themes of grievance and difference can be used to justify a public-centric economy. And green BS has no effect either. What this report does say is that the current policy of rolling back our economies is a very bad thing to do. So blow up the EU, the UN and the current US/FED policies because they are contra productive. It’ a positive Easter message but where is the Easter Bunny and where are the eggs because I can’t find them. In Asia, public and private plantations have been developed as well as small farms. The benefits of wealth creation should be obvious to all but the ecoloons. According to the “consensus” (in the 60’s) we are currently starving because the World’s population has exceeded both the food and water supply. Of course we’re doing it in the dark because we ran out of oil 30 years ago. For the Ehrlichs, language about reducing the ecological footprint tends to be quickly juxtaposed to the real rationale–reducing “social inequities.” Precisely the same aims and means as the OECD’s Great Transition and the UN’s Post-2015 described Agenda. Greater wealth also promotes the development of technology. With estimates of climate sensitivity coming down, there will be a longer period until Earth’s atmosphere becomes dangerously hot (assuming that we accept some variant of CAGW). We may be talking about a postponement of one to two centuries. 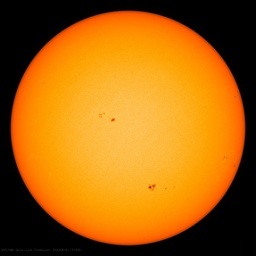 In the meantime, humanity will be burning fossil fuels, but there is a limit to how much we can burn. I won’t suggest that peak oil kicks in, because the peak oil prophesies have somehow repeatedly missed their mark. But what can be foreseen is that we will burn the more accessible stuff first, leaving the more expensive stuff for later. The price of energy will necessarily increase, driving both conservation and discovery of alternative technologies. Now, it’s true that if someone suggests alternate forms of energy immediately, be they solar or fission or fusion, there will be all sorts of serious objections. However, it’s quite unbelievable, at least to me, that we won’t have worked out the problems of one or more of these forms of energy within the course of a century. And if we do, then emissions of carbon dioxide will cease to be a worry. To have a factor of three real growth in income will require roughly a factor of three increase in energy production and consumption of resources. That might be fairly easy in some undeveloped countries, but will not be easy at all in the west. We have gotten to here on cheap oil, but the low hanging fruit has definitely been picked already. Of course, the problem with the GreenReich is that they think they know which comes first – and they’re wrong. In all respect I suspect that in the late 1700s and early 1800s they said pretty much the same thing in relationship to wood from trees and whale oil. travel the globe. third world countries have rubbish lying everywhere because there is no money to clean it up. rats and flies are the norm. It is only as countries become richer, that surplus funds become available to clean up the environment. And it is only after the environment is cleaned up that the environmental movement itself becomes a threat to the prosperity that made the cleanup possible. Like auto-immune disease, after the disease is beaten back, the immune system then goes on to attack the body. Perfection is the enemy of good. In seeking to make the environment perfect, ultimately the environmental movement needs to eliminate the source of pollution, humanity itself. Beyond that, every life form produces waste products that are harmful to other organisms. This pollution can only be eliminated by eliminating life itself. It’s not Ridley being optimistic. Here’s his quote: “But I am not the one doing the extrapolating. In 2012, the Intergovernmental Panel on Climate Change (IPCC) asked the Organisation for Economic Cooperation and Development (OECD) to generate five projections for the economy of the world, and of individual countries, in 2050 and 2100.” It’s the UN “alphabet soups” providing the optimism. Population explosion has already stopped 2 decades ago. Since then global population under age 15 is stable, slightly below 1.85 billion. Population is still increasing, but just because people are getting older, for they have a chance to, as opposed to the good olden days when most of our progenitors used to die at a young age. However, this population is not explosive any more, one can never produce more than one old fart by simply getting old, therefore growth is not exponential. I never thought much about the CAGW movement until just a few years ago, when it dawned on me how much it sounded like the Population Bomb movement I had previously read about, and I subsequently came to the conclusion that both movements were, in my opinion, intimately connected to each other. Did not know at first that any others felt the same way, but the connection is becoming more and more obvious. There are so many parallels, and in some cases the same loathsome cast of characters. They both have the same anti-human/misanthropic/repulsive ideals behind them, and, in both cases, are more anti-science, and anti-human progress, than pro-science. Especially as a Christian, I cannot believe people of faith can study this stuff for any length of time and not be thoroughly disgusted by it all. I’m glad I found this site, I’ve only been here a short while, and it ain’t perfect by any means , but it has a lot of value for me. Thanks again. What jobs will the worlds future worker be performing that will earn $42000. Will a McJob be paying that kind of money in 2100? This assumes that the world economies wont collapse because of the massive debts governments owe. Quite agricultural in fact. A pity since the racing is pretty decent right now. Other way round: put the word “green” somewhere in your company name, or product name or description, and gov’t will float yer boat. Riches for a few in the short run, crap sandwiches for all in the long (hold the bread). Ah, yes. A central African earning $43,000 per year crafting bush meat sub sandwiches. PETA might go apoplectic. There is no amount of CO2 that we can release that would have any effect on the climate. The fact is that CO2 partitions 50 to 1 into the oceans, which means to double the CO2 in the atmosphere, we would have to emit 50 times as much as the absolute needed to double CO2. As there is not enough available carbon to burn, we could raise the CO2 about 20% theoretically. In reality we are not the major driver of CO2 in the atmosphere, but the oceans as they warm and cool are in control. At all time frames, CO2 ALWAYS follows the temperature and not the other way around. Of course, the political agenda demands that we be the driver of CO2 and thus global warming. Remember, they simply rebranded “global warming” as “climate change” because actual global warming stopped about 20 years ago and the oceans basically stopped warming 30 years ago, in the middle 1980s. It benefits me little to hear predictions of economic growth of poor countries which use the dollar. It may make sense to an economist who can parse the relative values of 2020 African lira or francs, translate those into “real lira” or “real francs” of 2014, toss in an algorithm for the cost of living and convert those figures to dollar amounts, but… it can be easier to see than that. As Matt Ridley proposes In his book The Rational Optimist, human specialization brings with it enormous gains – gains that are likely to continue. In a chapter titled “A Better Today” he traces the evolution of “cheap light”, a value which we can all appreciate more tangibly than the dollar. In a sense, he concludes, mankind has undergone a 43,000-fold improvement in quality of life. The fact that such gains are uneven across cultures should not prevent the push to continue.along this path. The rich get richer, but the poor do even better. Between 1980 and 2000, the poor doubled their consumption. The Chinese are ten times richer and live about 25 years longer than they did 50 years ago. Nigerians are twice as rich and live nine more years. The percentage of the world’s people living in absolute poverty has dropped by over half. The United Nations estimates that poverty was reduced more in the past 50 years than in the previous 500. Or in 1959, saying that men would be landing on the moon in ten years. Oh, I forgot. I’m afflicted with conspiracist ideation. That landing was a hoax. Frodo, yes! From Malthus to Eugenics to Ehrlich to CAGW, these movements are plausible, pessimistic, puritanical, paternalistic, and patrician. All benefit the elite at the expense of the poor. created a LOT of new fields to work in, many of them well-paid. You need to open your mind a bit. They are banking on the fusion project to solve the energy problem, but this is a project where there is not yet light at the end of the tunnel. Your were most likely better off with the In $438 in 1900 than your are with the $42000 in 2000. Oh? Even in the U.S.A., in 1900 the average life expectancy was 47 years. know the U.S. figures) is 18.6 years. debased, but your speculation is a definite reach. I don’t believe futurologists. If in 1928 you had asked one how the world would look like today, he would obviously not have been able to tell, though he would have given you an opinion. Think wars, computers, Hitler, etc. Just consider what a person in 1900 would have envisaged for the year 2000. Such a person would not have had the necessary information to make a realistic guess. So it is from 2000 to 2100. All we can do is try to do no harm in the meantime. Anyone who tries to obstruct progress is more likely than not doing harm. Increased wealth for individuals leads to lower rates of fertility and greater care for the local environment. Increased authoritarian control leads to higher rates of fertility and less effective care for the local environment. Get the authoritarians out of the way and let freedom flow unleashed save for a basic rule of law preventing abuses of power by the elites. At present we have the global elites trying to consolidate their powers via scare stories such as climate change and peak oil amongst other scenarios. We let them do so at our peril. The year 2100 could see a global population peak having passed with a managed population decline in progress and technological advances we cannot envisage. The glass is half full and not half empty. In 1908, build a runway and airport for the latest and greatest airplane then flying..
You need: One each grass pasture about 100 feet wide. A tent, and a can of gasoline. Use the fence around the pasture to keep the cows off of the grass. The plane: No canopy, two seats, and cloth wings. Now, just 40 years later, build an airport. You need a 300 foot wide runway built of reinforced concrete 3-4 feet thick and 14,000 feet long for a plane with a take-off weight approaching 420,000 lbs, with the B-52 on the drawing boards at 480,000 pounds take-off weight. Add another runway for crosswinds, a few taxiways, and several acres of reinforced concrete for the planes to sit. (This one airport in 1948 will require more concrete than was ever poured prior to the (not-yet finished!) Panama Canal, and more pavement than even existed in 1908 in the entire world!) Add hangers larger and wider than any building in the world for maintenance and rebuilding, with moving doors alone larger than most structures in 1908. Add a couple of Fuel tanks to hold few hundred thousands tons of fuel for the bombers, plus all of their piping. A power plant that exceeds the generating power of most cities. And that is just ONE airport in Maine. There are dozens elsewhere in the world like it, and 47 other states in the continental US, Alaska, Hawaii and Canada. Panama Canal …. Apologies for a mistake in the article. The global average income in 2100 in SSP2 is $60,000, not $100,000, which is for SSP1, so in SSP2 it is a 8-fold increase. I misread the two lines on the graph. The other numbers are correct, including the $42,000 Congolese per capita income in SSP2. Let me first point out that there is no evidence that CO2 has any effect on climate. There is no real evidence in the paleoclimate record. For those who believe in the greenhouse effect, the primary greenhouse gas in the Earth’s atmosphere is H2O and it provides ample negative feedbacks to changes in CO2 and other greenhouse gases so as to mitigate the effects of these greenhouse gases on climate. The proponents of AGW often for get all what H2O does in response to changes in greenhouse gases. In particular they tend to forget that in addition to being a greenhouse gas, H2O is a major coolant, moving heat from the Earth’s surface to where clouds form. More heat energy is moved by H2O via the heat of vaporization then by both convection and LWIR, absorption band radiation. More H2O entering the atmosphere means that more heat energy gets moved. So there is no real connection between man’s use of fossil fuels and climate change. We live on a planet of finite extent with finite resources. Our current out of control human population increase is being fueled by the use of fossil fuels, a very finite and non sustaining resource. New technology is making more fossil fuel available but we are currently trying to use it up as fast as possible. It may be many thousands of years before the current interglacial period ends but our fossil fuel resources, especially with an expanding population may run our in only hundreds of years. When it is gone it is gone. Our current sustainable energy resources cannot support such a large population of humans. If man does not control his own population, Nature will, catastrophically. To avoid massive pain and suffering we need to consider what needs to take place on both the relatively short term and the longer term . We need to curb human population and gradually get it down to where sustainable sources of energy will be sufficient just as they were before the advent of the industrial revolution. It has nothing to do with climate change. And in this storyline, by 2100 the world population has reached 12 billion, almost double what it was in 2000. This is unlikely, according to the United Nations: 10.9 billion is reckoned more probable. Here is some more optimism about the future. I don’t understand why such observations make so many people very angry. Do they dream of calamity? AGW and Warmists are the same. And now for some ‘bad’ news. This is what we maybe worrying about a lot more in 2100. Ehrlich and other Malthusians may be a forgotten breed in 2100. Children won’t know who Malthus was. The world’s population is growing—and aging. Very low birth rates in developed countries, coupled with birth rate declines in most developing countries, are projected to increase the population ages 65 and over to the point in 2050 when it will be 2.5 times that of the population ages 0-4. This is an exact reversal of the situation in 1950. I had completed second year science in 1958 and had a job as a chokerman in Jarvis Inlet in southern British Columbia for the summer. In an argument in which I was the only dissenter, it was roundly believed that man would never head out of the earth’s atmosphere in a rocket. I argued that Sputnik 1 was 100% guarantee that we would indeed depart from this mortal coil by rocket. I was so fervent about it, that I couldn’t get anyone to take my modest bet (I can’t remember how much it was) but my certainty tempered theirs. I swithched to engineering that fall. I have always been a ‘technology will do whatever we can imagine being done’ type of guy. It is also why I never jump on gloom and doom band wagons. Such folks seem to have something permanently amiss, a kind of sheepy helplessness that would scare the heck out of me. I believed it highly plausible a decade ago that we were having a significant affect on the global temperature, but it didn’t shake my certainty in technology being the solution to such problems. I also didn’t take long to see that the “science” being relied on was political science. I pride myself on this optimistic view of technology as I suspect do sceptics in general. Those not having it cannot by definition be a part of any solution (except a destructive one). Population control is going to be the problem. A falling birthrate may seem good, but a rapidly aging population does not. Soon someone will come-up with a solution to the rapidly aging population. I doubt that solution will be well-received. We live on a planet of finite extent with finite resources. Our current out of control human population increase etc. First of all, there is no out of control human population increase whatsoever, the population bomb was defused twenty years ago. Then, an ever increasing portion of resources needed to improve life is information. A finite resource as well, but we still have plenty of way to go with an upper limit of information storage at 10⁷⁰ bit/m². Energy is a non-issue. No energy is needed to store or process information, only to delete it (to make room for more), but not too much. According to Landauer’s principle at room temperature one can erease information at a rate of 3×10²⁰ bit/sec using 1 W power input. At CMBR temperature 10 mW is sufficient to do the same. It is my understanding that the worlds population is continuing to increase yet its surface area and fossil fuel resources are not increasing as well. Where I live, not long ago was all either farm land or open wild land. Now they are filling in the last vestige of farm land and starting to build townhouses. The population density of my community continues to increase Short of a major calamity I do not expect things to change for the foreseeable future. Someone in the Congo might be earning $42,000 in 2100? I don’t want to throw cold water on such a positive scenario, and I like Ridley, but he’s way too optimistic here. And these projections? They just seem goofy to me. On the one hand I think it maybe too optimistic, political and social stability are important and we just don’t know how it will pan out this century. Despite the internal strife they just manage to hang in there. GDP growth speeded up in 2012 to 7.2%, from 6.9% in 2011, driven by vigorous performances in mining, trade, agriculture and construction, despite the political situation and lawlessness in the eastern provinces. The economy should continue to expand in 2013 (8.2%) but prospects depend on political stability, better security………..
Growth should continue, to 8.2% in 2013 and 9.4% in 2014, in the light of world demand for minerals and the major investment in the sector in recent years. OK, let me set the cat amongst the pigeons. Malthusians, 3,2,1, GO! But this can’t be true. I saw on the news that they were dying by the millions, starving babies, AIDS, Ebola, starvation, famine, genocide, child soldiers, blood diamonds, failed crops and general nastiness – a no hope continent. These are surely lies. Even as Nigeria battles Islamist terrorism, this remarkably entrepreneurial nation is racing ahead. Goldman Sachs GS +0.23% predicts that Nigeria’s economy will be bigger than Canada’s or Italy’s by 2050—and not far behind Germany’s. And this is just one of 54 countries on a large continent that is home to six of the world’s 10 fastest-growing economies and the youngest population on the planet. The same rapid evolution is visible in Ethiopia, Ghana, Kenya, Mozambique or Tanzania. Already Africa has a bigger middle class than India, driving the consumer spending that powers this economic swelling. Contrary to popular conception, the majority of Africa’s most rapidly expanding nations do not rely on natural resources……..
Africa is changing for the better. In the past decade, Africa’s growth rates have quietly been approaching those of Asia. Last year, according to estimates from the International Monetary Fund, seven African countries appeared on the list of the world’s 10 fastest-growing economies, each with annual growth rates of 8% or more. Democracy is becoming firmly entrenched, with all but a few of the continent’s 1 billion people expected to vote in this year’s democratic elections. Child mortality rates have decreased significantly, with 12 countries reporting declines of more than 4.4% per year. Polio was eradicated in most parts of Africa and now AIDS contagion levels are beginning to recede. Millions of men and women are healthy again and back to work, and more children—especially girls—are in school than ever before. Bravo – this is great stuff! But I am appalled that not one commenter above mentioned Adam Smith. His ideas (really, his understanding understanding of, and making plain to all, what really drives human development), infuriating as they are to Democrats and other socialists/communists, have fueled this incredible explosion of wealth. It IS hard reading (i.e. The Wealth of Nations) but you are impoverished if you haven’t read it. More signs of Malthusian gloom. All hope is lost ye who enter here. STAAAAARVE! OK, I think you get my point. Just like with global warming we are fed [no pun intended] an endless stream of doom and gloom about the world. You could call me a cherry picker which is what I would call the doomers. ……Some readers may find that statement incredible. And indeed the haunting images of starving Africans are so ingrained in our collective psyche that many people still cling to the notion that Africa can’t feed itself—and maybe never will. That conclusion, however familiar, is wrong. Fewer Africans face famine now than at any time since the world began counting……..
….. in Uganda in East Africa and in the 15 countries of West Africa, food production now outpaces population growth. In Ghana, for instance, farm output has jumped by 5 percent every year for the past 20 years, which helps explain why the poverty rate there has fallen by half. Even infamously food-insecure Malawi and Ethiopia now grow record amounts of crops and even export surpluses to their neighbors. The mounting evidence of this historic reversal is impossible to ignore. Against the new reality, international food agencies that spent decades proclaiming Africa’s inevitable doom are being forced to shift their rhetoric……. G. Pascal Zachary – Arizona State University. We live on a planet of finite extent with finite resources. Our current out of control human population increase………..
Don’t panic, it is self correcting. In 2100 we will not be talking about an “out of control human population increase”. We will be worried about how to get mothers to INCREASE the number of children they give birth to. The finite resources are still available, and when they are about to finish we just find some other alternative. Think copper drainage pipes replaced by PVC. Thank you for reading my post and commenting. I wish I could share your optimism but those who fail to plan, plan to fail and that goes for mankind. Where I live, the county, not all that long ago was primarily agricultural and they have been gradually paving it over with most of our food being imported. Ours is not the only county where that has been happening. It takes a lot of fossil fuel energy to import food from outside the county and when that energy runs out we will be in trouble. In our state the population keeps outgrowing the state and federal government’s ability to provide water. They have built reservoirs everywhere but it has not been enough. More and more communities end up having to ration water at one time or another. Right now the problems are relatively gradual but they do continue to get worse. If we suddenly run out of fossil fuel which probably will not happen for at least 200 years. then there goes food, trans portion. heating, cooling, and lighting. Few will survive. If we panic and take drastic action it will probably end up causing more problems and suffering then it prevents but we do have to recognize the problem and start doing something about it. Eco-Worriers please read about the horse manure problem of the late 19th century. For well over 100 years pessimists have got it wrong about human progress more that optimists. They think human beings look at a looming calamity and are unable to act. They assume things will stay the same while the calamity looms. Bad thinking which leads to being wrong more times than you are right. Sorry, but that is the truth. ITER under construction in France is the last scientific Fusion experiment and the first crude Engineering experiment and attempt at commercial scale Fusion generation. About half finished, it will be capable of about 700 MW thermal output for hours on end. Its follow on, likely to be begin construction in the 2020s, will be the first genuine Power Plant prototype to add electric power to the Grid. Clean, limitless and inexhaustible, Fusion energy will change our world. During the 60s and 70s the Soviet Union trumped the US in every “green” standard…their clean water, clean air and even RF and nuclear radiation standards on the books were far better than ours here in the US. These examples of one-upmanship were crowed by the Soviets at every opportunity. Except that in reality Soviet air and water were far far more polluted than in the US, especially after automobile catalytic converters came into use. The reason? Americans could afford the cost of keeping their air and water clean. The Soviet standards were so impractical they had to be ignored, resulting in worse pollution than if even a tiny effort had been put forth to control the worst pollution. Mr. Ridley is absolutely correct. The more prosperous we are, the greener we will be.
. . . We live on a planet of finite extent with finite resources. Our current out of control human population increase is being fueled by the use of fossil fuels, a very finite and non sustaining resource. New technology is making more fossil fuel available but we are currently trying to use it up as fast as possible. . . I love citing those two posts by E. M. Smith. Because he is right. Aside from a little gas escaping from the top of the atmosphere, and rockets we have sent out into the Solar System, not a molecule of stuff has left the Earth. Don’t tell the Club of rome. It all depends on which fusion project you’re watching. Rossi’s device just finished a several months-long test. It’s unclear when the results will be released, possibily in June. Apparently things went well. Yes Chris.R I was only referring to the currency and yes over all our Our quality of life has increased vastly. The method of projecting of trend, used here by Mr. Ridley, provides one with an unreliable guide to the future. The growing divergency between the projected and the observed global temperature under increases in the CO2 concentration provides us with a recent example of this phenomenon. This unreliability has a known cause. It is a consequence from neglecting the base rate in assigning numerical values to conditional probabilities. increased prices all around us. So using the rule of 72, the growth in he Congo should about double in 8 years. Or “wealthy middle class is disastrous for Marxism”? Marxism needs poverty to be the dominant ideology? The most important wealth distribution problem we will have in the near future, is that the middle class will disappear. There’s a second industrial revolution starting right now, and at the end of it, a very large share of both blue collar and white collar jobs as we know them will be gone. The emerging economies of Asia and Africa has a very short time window to take advantage of their cheap labor force – US companies are already replacing production in China with robot factories at home. The real challenge to political and business leaders is how to ride through this transition with as little social unrest as possible. Wealthy middle class people are suckers for Marxism as long as you sell it under a different label. See cultural marxism, Frankfurt School, Critical Theory. Nearly all journalists and newspapers make their money with it. Mostly it’s called environmentalism at the moment. In 1900, avg US income was $438, by 2000 it had increased to $42,000 almost a 100 fold increase. Nonsense, you’re ignoring inflation. I’ll use US BLS’s inflation calculator to show this. It only goes back to 1913, but that’s close enough. It shows that $438 in 1913 dollars is equivalent to $7,618.55 in 2000 dollars. So the increase was 5.37-fold, not 100-fold. You were close. Actually, it is US schools that are already replacing education with robot factories at home. It is a nationalized education program called Common Core. The destruction of the power sector with worthless, expensive, intermittent renewables has already driven production out of many European countries. For example, the UK just recently shut down its last aluminum plant as a result of its disastrous Climate Change Act. I do not know what would make the US an exception to this unfortunate result of introducing shortage, unreliability, increased expense, and volatility to electricity prices and supply. You had a compulsory Prussian school system at least since Dewey, how much worse can it get. (As a German schoolkid I had this uneasy feeling all my teachers were assholes delighting in wasting my time. I only found out much later why. (WOW. Dewey was a Trotzkyite. Someone in the Congo might be earning $42,000 in 2100? I don’t want to throw cold water on such a positive scenario, and I like Ridley, but he’s way too optimistic here. It implies a 6.2% GDP growth rate. China’s rate has been 10% over the past 30 years. It may be partially fake, and in any case I don’t think it could stay very high for the next 86 years, but it does make the implied Congo rate not utterly absurd. Still, I find it hard to believe. I doubt that any country has ever sustained a very high growth rate for so long as 86 years. Niels Bohr? I thought it was Yogi Berra’s. The 6.2 % are composed of a) the population growth b) the GDP/capita growth (economic advancement – mostly through rising workforce participation rate, which is easy in an economy that starts with a very low rate). So it might actually be achievable and maintainable for quite a while. This is a really terrific video on education so far, esp. the remarks about Open Source education at 9 minutes. * Many thanks DirkH! Yes, I believe that just showing up every day at a school, and sitting at a desk, being given tiny incremental steps to follow, gives the wrong idea to children about what learning is, and what accomplishment is. Sure, it’s just I doubt so long a while as 86 years. Below maybe why the Congo projections is not as unrealistic as previously thought. A LOT depends on future stability and good governance. Whatever the numbers this nation has the potential for the average person earning from “$300 a year, will then earn $42,000” as per the OECD middle scenario. Kinshasa, 10 October 2011 – With half of Africa’s forests and water resources and trillion-dollar mineral reserves, the Democratic Republic of Congo (DRC) could become a powerhouse of African development provided multiple pressures on its natural resources are urgently addressed. Willhaas – has the study of the history of human civilization taught us anything? How many times do the Ehrlichs of the world have to be stupendously, galactically wrong in their predictions of doom before people will ever learn? Ehrlich, perhaps the foremost idiot in this tragic comedy, is by training an Entomologist, and it sometimes appears that he looks upon humans, and values them, as much, or perhaps less that he does insects. Excuse me, but I am not a parasite that is ravaging the earth – I am a human being, the most marvelous creation the entire Universe, and I live on the Earth – a fantastic, bad-@$$ planet the appers to be designed in a Universe especially for us – to something like 1 vs 10 to the 240th power, last I checked. But then again, I don’t have to worry – I live in a part of the planet where I would be largely protected if freaks like Ehrlich have their way and (metaphorically) decide to spread industrial strength Raid on the planet in the attempt to largely rid it of its foremost parasite – us. With the slaughter of human life in the womb, unborn children are looked upon, not as innocent human life, but like a parasite that can be exterminated at will. The population bomb freaks take it a step further, now we are nothing but parasites after birth as well. And, it’s always the undeveloped, suffering 3rd world – Africa, parts of India/Asia, etc – that are the main target for the “population reduction” – as, for example, in the case of some the bigger idiots in the 1960s and 70s – who championed the withdrawal of food aid from “lost causes” like India and Egypt and the subsequent forced starvation of millions upon millions of innocent people. When will people EVER learn? The solution to the rapidly aging population is that, in richer, more medically advanced (and less ageist) societies, many people in their 60s, 70s and 80s are still contributing fully to those societies. In other words, what’s the problem really? Ric Werme:which fusion? let’s keep it serious, I mean the Tokamak. Have a look on YouTube talks by Hans Rosling on economic growth and population – very enllightening as to recent and future trends. It may be even better. The only UN population projections ever close to reality are its LOW or LOW FERTILITY spreadsheets. They now predict a peak in about 2045, at around 8bn., declining thereafter. To be clearer, the UN used to have a LOW BAND in its Population Survey spreadsheets, but now terms them LOW FERTILITY. Maybe the only way to avoid a population crash and demographic crisis is to crank up the Huxleyan artificial wombs.